Yes - that's right. The next time you bring home a fresh pineapple, enjoy the fruit and get a bonus houseplant to boot. 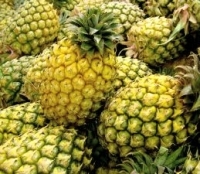 When you prepare your pineapple to eat, cut off the top leafy portion including about an inch of the fruit. This needs to be hardened off. Remove the outer older leaves by pulling them off and place the top in a sheltered area for a week or so until the cut area of the fruity part has the texture, look and feel of leather. Select an 8 inch clay pot and put about 2 inches of pebbles in the bottom for drainage. Fill to within two inches of the top with a prepared mix suitable for succulents such as christmas cactus. The soil needs to be light and sandy with a good portion of organic matter. Pineapple is of the bromeliad family and can not stand heavy soils and constantly moist conditions. When ready, place the pineapple top in the pot and fill around it with the mix up to just below the base of the remaining leaves. Water well and tap the pot to settle the soil and anchor the cutting. Water weekly to keep reasonably moist until it is apparent that the plant is growing. After that, water only when the top inch of the soil is completely dry and there is no water standing in the bottom of the leaves. Once established, water the plant from the top so that water collects in the crown. Pineapple are moderate feeders, apply ordinary houseplant food, diluted to half strength every other watering. If you are growing your pineapple as a houseplant, remember that it is a bromeliad. The plant needs high light conditions, but don't expose it to direct sunlight coming through a window which will burn the foliage and 'cook' the plant. In the summertime, you can safely put the pot outside in an area that receives 4 to 6 hours of sun daily. Well - now that you have your pineapple growing and healthy - where is the fruit? It will take patience along with ideal conditions for your houseplant pineapple to produce a flower. You may have to wait as long as two years - or it may never happen. If you are lucky and can get your plant to bloom, it will eventually produce a new pineapple. The whole process from flowering to maturity can take up to six months. The part of the plant that has produced the new fruit will subsequently dry up. There should be small suckers growing around the base of the original plant. These will grow up to repeat the cycle. Bottom line, if you have the patience to wait, you can grow, bloom and enjoy the fruit of your own homegrown pineapple. Even if your plant does not bloom, it makes an interesting and attractive addition to your houseplant collection.